Available Feb. 13-17, CPK’s “Sweet Deal for Two” prix fixe menu includes the choice of an appetizer, two entrées and a dessert for just $35. 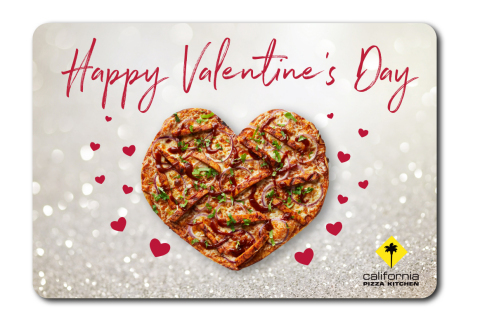 If busy schedules or different ZIP codes are keeping you and your Valentine from sharing a heart-shaped pizza, CPK has a delicious solution: from Jan. 29 through Feb. 17, CPK will offer digital Valentines for CPK fans looking to share the love with a special Valentine’s Day e-gift card. Nothing says “I love you” like the gift of pizza, and nothing gets your Valentine’s Day message there quicker than an e-gift card. Visit cpk.com to personalize and send to your loved one. For more information on all of CPK’s special Valentine’s Day offers, please visit http://www.cpk.com/sweetdeal. *Heart-shaped pizzas available Feb. 13-17 upon request and on crispy thin crust only, for no additional charge. Valid at participating locations; not valid in locations in Hawaii, Guam, airports, stadiums, the Mirage Hotel in Las Vegas, the Grand Sierra Resort in Reno, or international locations. Dine-in and take-out only; not available through third-party delivery partners. 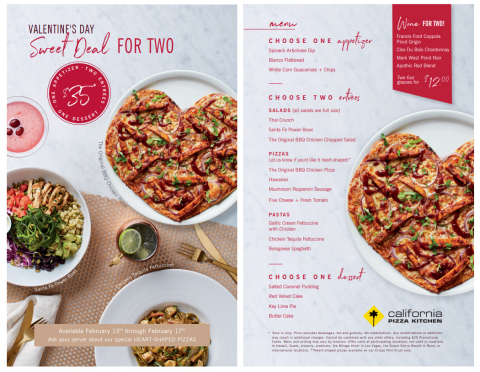 **CPK’s Sweet Deal for Two menu is available Feb. 13-17 for dine-in only. Price excludes beverages, tax and gratuity. No substitutions. Any modifications or additions may result in additional charges. Cannot be combined with any other offers, including $20 Promotional Cards. Menu and pricing may vary by location. Offer valid at participating locations; not valid in locations in Hawaii, Guam, airports, stadiums, the Mirage Hotel in Las Vegas, the Grand Sierra Resort in Reno, or international locations. 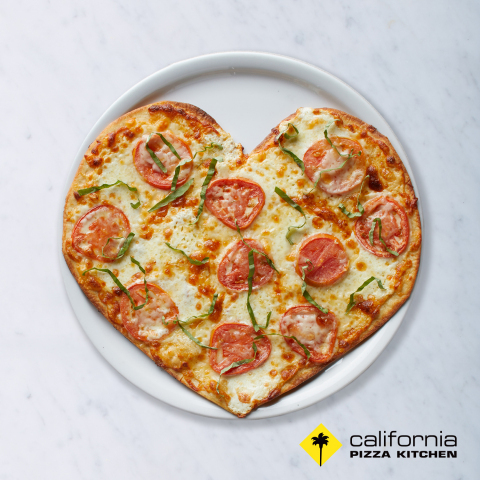 California Pizza Kitchen Celebrates Valentine's Day with Heart-Shaped Pizzas, Sweet Deals, and Digital Valentines.